Madden NFL has correctly picked 9 of the last 12 Super Bowl winners. 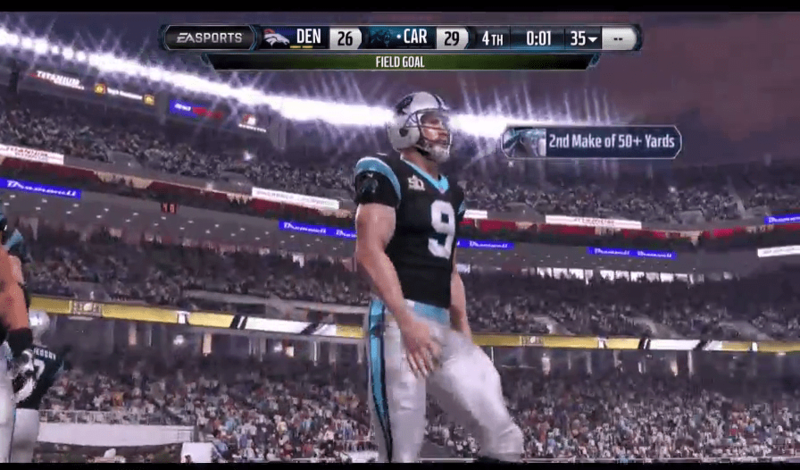 Super Bowl 50 is one week away and here’s another Madden simulation prediction for Broncos vs. Panthers! Denver Broncos win the coin toss, but their first play results in Manning throwing an interception. Carolina Panthers have amazing field position and Cam Newton throws it to the corner of the endzone for an easy touchdown! PAT is good. Broncos get the ball back and are trying to get something going. But after a few plays, Manning gets hit after he drops back, and fumbles at the 31yd line. Panthers are able to get a first down, and a few extra yards, but Denver keeps Carolina out of the endzone. A simple field goal from 21yds puts Carolina on the board for another 3. Denver runs the kickoff back to about the 20yd line. They drive all the way down the field over 6 minutes, but have to settle for a field goal. Panthers get stopped by Denver’s defense and go 3 and out. Denver again with the ball, their drive is slow like their others until a 3rd and 10. They convert with a 15yd pass play, putting them on Panthers’ 27yd line. Unfortunately for Denver, Carolina steps up their defense, and Broncos settle for a 36yd field goal. Carolina is on their own 31, 3rd and 3, Newton, pass over the middle – good for the 1st but, FUMBLE! Broncos take over at Panthers’ 36yd line. Although, Carolina’s defense deserve an award, they keep Denver out of the endzone again! Denver successfully kicks a 15yd field goal. Panthers start their drive at their own XY, and take their time getting to Denver’s 21yd line. 2nd and 9, 3 secs before 2 minute warning, Newton runs for 10 yds and gets the 1st. Fast forward to 3rd and Goal at the 6yd line. Newton in shotgun, looks left, Jerricho Cotchery is wide open and easily walks into the endzone for a touchdown! PAT is good! Denver takes over with 1:15 left in the half, but once the clock hits 55 secs remaining, Denver is looking at 4th and 16. Broncos punt it away and Panthers run it back 14yds to their 48yd line. Panthers don’t let up, and are able to move the ball downfield, and knock through a 40yd field goal, leaving 1 second left in the half. Carolina gets the ball to start the second half, their own 28yd line, 2nd and 7 – BOOM – Stewart breaks all the way to Denver’s 10yd line! A 62yd run!!! Next play Newton will run for 5yds. But Denver’s defense steps up hard! Carolina’s next run goes back to the line of scrimmage. And on 3rd and Goal, Von Miller gets to Newton and sacks him back at the 14yd line! Carolina settles for a 31yd field goal. Each team takes turns going 3 and out. But Carolina ends assembling a drive. It’s 3rd and 11, and just like before, Newton sacked on 3rd down for a loss of 6yds! Although Gano has no trouble booting it through for a 51yd field goal! 11 minutes and 28 seconds left in the game, and things start to heat up! Broncos take a knee in the endzone to start their drive at their 20yd line. Manning comes alive during this drive, completing 6/6 passes with the last pass being an 22yd pass for a touchdown! PAT is good. Latimer pulls it in for Denver’s first touchdown! Broncos defense stops Panthers with a 3 and out to get the ball back on their own 36. Manning continues his streak on this drive going 8/9, where on the last pass he gets hit as he throws. This sets up 4th and 6 and Denver decides to go for it! Manning is in shotgun, drops back and hits Demaryius Thomas at the 22yd line for a first down! Manning again out of the gun, hits Vernon Davis at the 3yd line, and Davis makes it out of bounds, stopping the clock at 4:10 in the 4th. That pass puts Manning at 378yds for the game! Carolina defense is ready for a run up the middle, but a handoff to Ronnie Hillman (SDSU!) to the right side, and he’s easily in the endzone for another Denver touchdown! PAT is good. 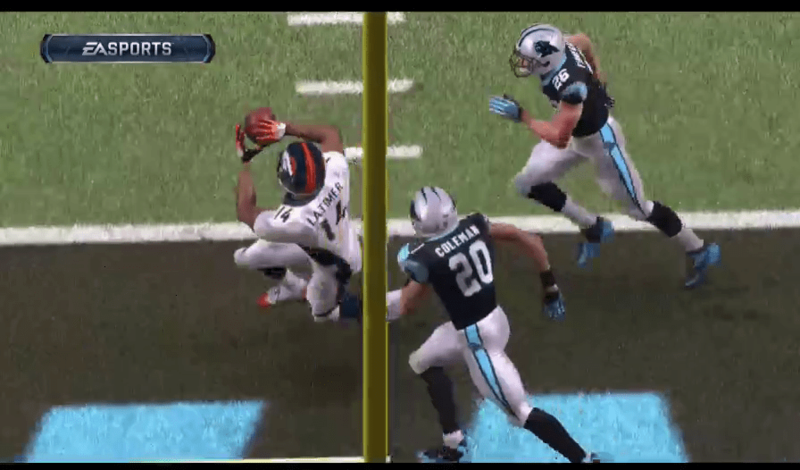 Carolina goes 3 and out yet again, giving Denver the ball back on their 20yd line with 3:14 left in the game. Denver isn’t moving the ball as well, but they manage to convert on 3rd down, bringing them to their 38yd line with 2:28 remaining. Next play, Manning throws over the middle for a 7yd gain, and a short break for the 2 minute warning. Broncos are now in their 2 minute drill. They hit 2nd and 10 to get a 1st down with 1:33 left. A long pass to Emmanuel Sander is batted away, clock stops with 1:24 remaining. Next pass, also knocked down, 3rd and 10 with 1:20 left. 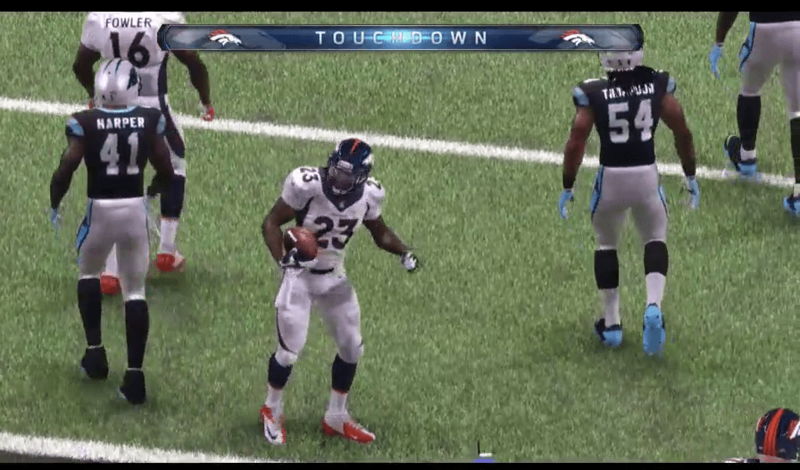 Broncos pick up 5yds, to put them at Carolina’s 35yd line with 1:10 remaining. Instead of trying for a first down, Denver goes for the field goal to tie, and knock it through the uprights with 31 secs remaining. Tied game! Broncos elect for a normal kickoff instead of an onside kick and Webb returns it to Carolina’s 31yd line. Newton throw over the middle on 1st down, and it’s complete for a 22yd gain. Panthers call timeout. Carolina quickly gets another passing first down to the right side, and uses their second timeout. Panthers are on Denver’s 37yd line with 17 seconds remaining. Panthers attempt a run and gain 4 to put them at the 33yd line. Game clock runs down to 5 seconds and Panthers call their final timeout. Carolina’s kicking team comes out on the field, but Denver tries to ice Gano by calling a timeout once he’s set. Back from the timeout, here is the moment of truth, Gano’s 50yd field goal with 5 seconds left is good! After the play, there’s 1 second left in the game! Denver gets the ball at the 20yd line after a long kickoff with one chance to win the game. Manning goes deep for Thomas but he’s triple covered, ball gets tipped, and that’s the game! 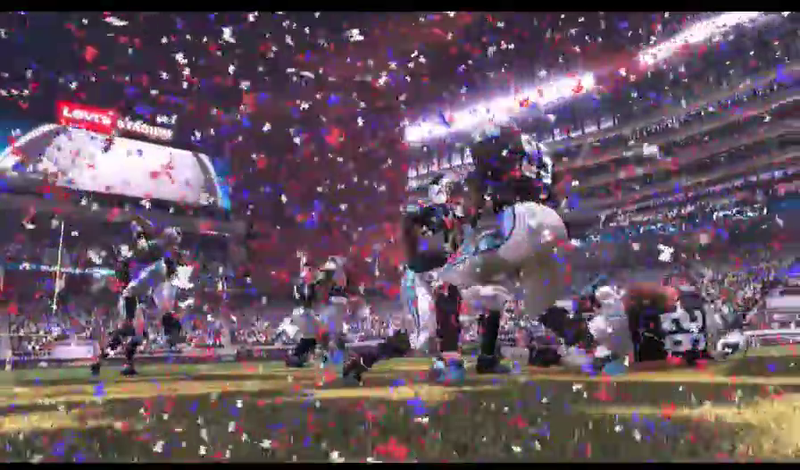 Carolina Panthers are Super Bowl 50 champions! 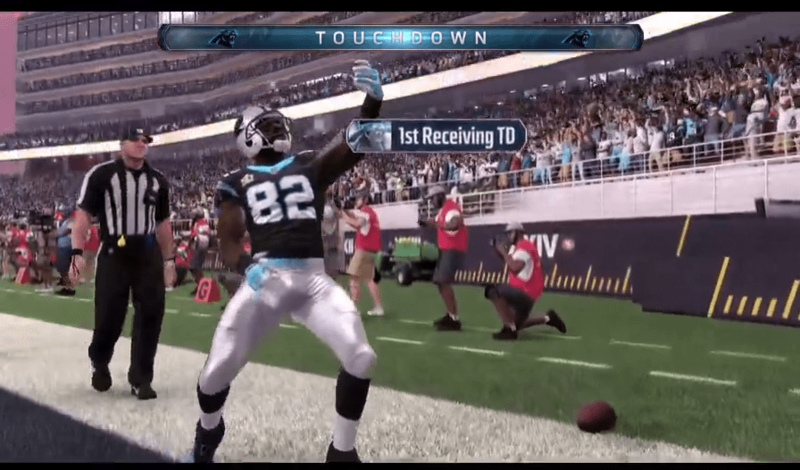 *This recap is based on my own simulation in Madden NFL 16. 15 minute quarters and rosters current as of January 25, 2016. Interested in seeing Madden NFL’s record for Super Bowl predictions? Wikipedia has you covered!